Mr. Gonzalez was the Society's Vice President for East Coast Operations from 1999 until 2006, when he assumed a broader role as the Society's sole Vice President. He served two terms as President of the Chesapeake Chapter of the Society from 1997 to 2007, is a past Secretary of the American Lighthouse Coordinating Committee and was a member of the National Lighthouse Museum Steering Committee. 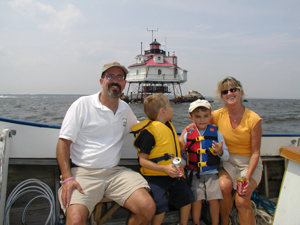 He is the manager of the Thomas Point Shoal Lighthouse and the Hooper Island Lighthouse, both located in the Chesapeake Bay and both obtained through the National Historic Lighthouse Preservation Act. Henry performs all of his lighthouse-related duties as a volunteer; in 2015 he retired from the federal government after a 31-year career in civil service as an engineer, project manager and senior executive, where he ably led and managed multi-billion dollar programs and hundreds of personnel. Lighthouses are in his blood: he is the great-great-grandson of a lighthouse keeper who served on the north coast of Spain from 1863 to 1904, and has a third cousin who is currently a lighthouse keeper in Spain. Henry and his wife, Chris, have seen over 300 lighthouses, primarily throughout the United States and Spain, Portugal, France and Norway. They have three children and six grandchildren, several of which are being trained to be future lighthouse keepers! He is the Chairperson of the Society’s Preservation Grants & Awards Committee and he and Chris lead a couple of Society tours each year. *** Pictured above are Henry, his wife Chris and their grandchildren on the way back from Thomas Point Shoal.